New Line Cinema seems to be playing things pretty smart right now when it comes to their upcoming slate of horror flicks. Annabelle: Creation, the sequel to the first spin-off in The Conjuring shared universe of movies, is set to arrive in theaters next weekend. Buzz for the movie has been terrific, but they just found a way to get some more butts in seats. According to a new report, an exclusive 4-minute preview of Andres Muschietti's IT is going to screen ahead of Annabelle: Creation in theaters. The news comes to us courtesy of Trailer Track who report that a 4-minute-12-second preview of IT has been rated by Consumer Protection BC and is set to screen before Annabelle: Creation. 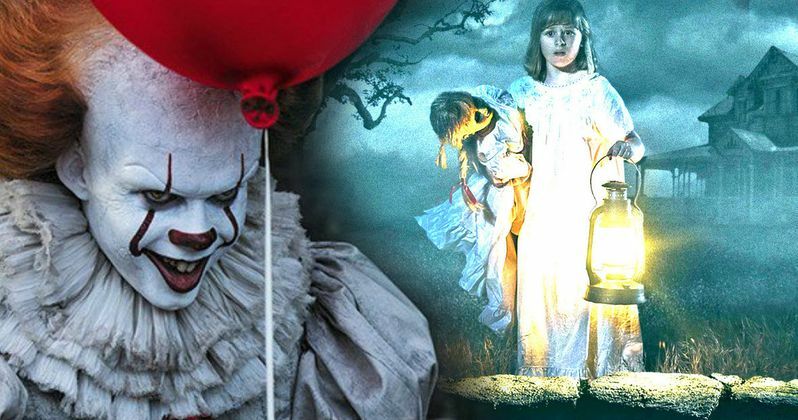 Considering how well the latest full-length trailer for the IT movie was received, this could be a major draw for horror fans who want a slightly larger taste of the highly-anticipated adaptation of Stephen King's beloved novel. What's more is that their report states that the preview is not expected to show up online. So if you want to see this IT footage, you're going to have to see Annabelle: Creation. This is a pretty smart marketing decision, but it's also one that doesn't really have a downside. People are incredibly excited for IT so getting to see more footage ahead of its September 8 debut in theaters is great. Not only that, but Annabelle 2 is currently sitting at a truly impressive 100 percent on Rotten Tomatoes. Director David F. Sandberg has crafted his own excellent horror movie with Annabelle 2, so if this gets more people in theaters to enjoy that movie as well, everybody wins. It isn't as though New Line and Warner Bros. are attaching this IT preview to some awful movie they are just trying to sell more tickets for. As far as IT goes, it is hard to think of any movie, save for maybe Star Wars: The Last Jedi, that people are more excited for heading into the latter half of 2017. So getting to see more than 4-minutes of footage from the movie just a few weeks before it arrives in theaters is a big deal. Though, Trailer Track notes that it isn't mentioned what this preview is going to include. Is it just going to be an extended trailer? Could fans be seeing one of the scenes that was shown at San Diego Comic-Con? Maybe a combination of the two? Either way, that is a pretty solid chunk of Pennywise action that audiences are going to be treated to. Annabelle: Creation is set to arrive in theaters on August 11 and could wind up being a big hit at the box office next weekend. This IT sneak peek can only serve to help at this point. So if you want to see some more of Bill Skarsgard's terrifying interpretation of Pennywise the clown, as well as a very solid horror movie in its own right, you're going to want to grab some tickets to see Annabelle 2 next weekend.